Calling all eye shadow fans! 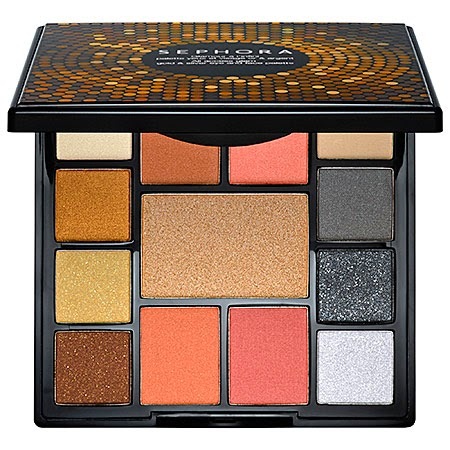 This year, indulge all their desires with this SEPHORA COLLECTION All Access Glam Gold and Silver Eye and Face Palette. This palette has gorgeous metallic shades, along with a highlighter (very flattering warm gold tone) - and 4 blushes. The eye shadow shades are perfect for creating glamorous eye looks and party looks. The Gold and Silver shades can be worn alone, or blended together (which is my personal favorite). The palette also includes a full sized mirror. It's small enough for a average day bag, to stash in a office desk drawer and to toss in a travel bag. The shadows are great quality, with good pigmentation and are smooth and easy to blend. The shimmer is very pretty and the metallic shades work well for wintertime. And the Palette is versatile enough to also create more natural looks as there are a several neutral matte shades included in the palette as well. The blush pans are on the small side, but will work with a smaller or blush brush to pick up a just the right amount of product.